This is a Replacement or an additional add-on fan for the Dometic Refrigerators, a must for refrigerators used in all slide outs. If you have a bad fan, this would be the replacement needed. 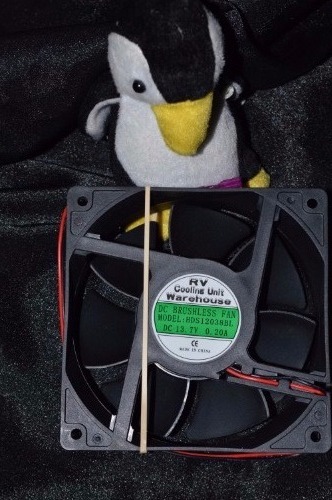 If you are getting bad cooling preformance, be sure to confirm that the fans are running during your use. The lack of good flow of air through the back side cooling unit coils is the most common cause of cooling unit failure. The lack of needed air flow will cause your cooling unit to over heat and a failure will happen. On all Dometic Refrigerators used in any slide out room there are fans, either factory installed or needs to be added for AIR flow, through the lower loops and the upper condenser fins for max cooling preformance. Added fans are the easiest way to increase the cooling ability of your refrigerator. The more heat that's removed from the coils back side, the cooler the inside food zone will be. We have a Dometic RM1350MX with 2 fans installed on the back panel. The OEM fans were not doing an adequate job and I had already bypassed the thermal control on the fins, so that the fans ran continuously. This past summer, one of the fans stopped working and I replace both OEM fans at the same time. The new fans were slightly larger in width, so that new holes in the metal flange on the fridge were required. The OEM electrical connectors were not standard, so new connectors on the fridge wiring and presto magic, the fridge was back up and running, coping with the 90 degree summer heat.